Over the past two days, a heated and lively discussion has taken place on the listserv for Games for Change (G4C), the New York based non-profit focused on so-called "serious" and social impact games. While some have bickered, the majority of the advocates, academics, and game designers contributing to the conversation have offered well-meaning insight into the dilemma of uniformly supporting the painfully vague concept of a "game for change." After all, what kind of change are we talking about here? 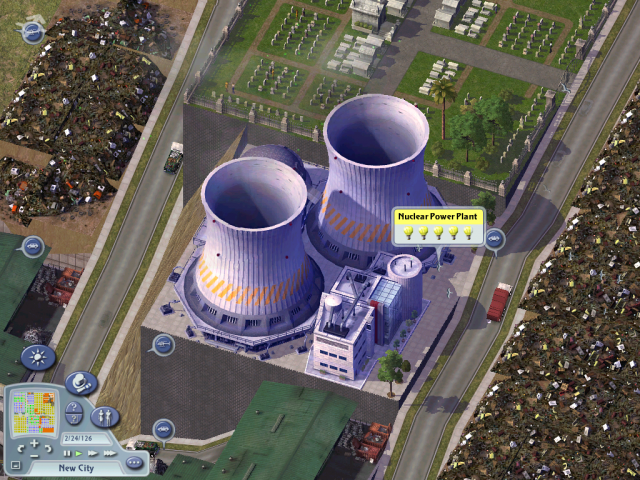 The topic resulted from a question by a listserv member (none of whom I will name here), asking how best to market a free online game meant to educate youth about career opportunities in the nuclear energy industry. Nuclear power, particularly in the United States, has a tumultuous history. Naturally, another user replied with a critique of nuclear power, stating that "G4C members should seriously question whether to help a game that promotes such an industry." While the decision to help is a personal one, the issues this dilemma poses is a valuable one. As another G4C member states, "the definition of 'doing good' seems to be what is under debate here." Nuclear energy aside, how do we decide whether a "game for change" promotes positive change? We could firmly deride a game that encourages young kids to abuse drugs, but such clean-cut examples do not exist. As games become increasingly employed as educational and persuasive tools, games with politically diverse and even contradictory themes will arise. Objectively qualifying and separating each and every serious game into positive and negative camps is a futile task. Games can both educate and indoctrinate. Indeed, we imbue all our cultural constructions with our own personal beliefs and ideologies, both intentionally and unintentionally. As one G4C member astutedly pointed out, "education is a political act." The difference between persuasion and propaganda is a thin line, particularly when it comes to digital systems, that can all too easily hide their intent behind a shroud of "fun." Social impact game designers should feel comfortable with well designed games, even when they disagree with the game's message, in much the same way an academic can respect a person's argument even if they disagree with its core assumptions. That is to say, our own arguments must be flimsy if our only defense against another sound argument is censorship. To use this analogy further, like a sound logical argument, a "good" game for change must be well constructed in addition to accomplishing its persuasive or educational task. Most of us can agree that subliminal messaging, while potentially effective, is an ethically dubious persuasive strategy compared to logic and reason. Games can foster incredibly rewarding discussions, particularly when in dialogue with each other, but they can only do so on even terms. As digital systems, games can inadvertently foster simulation bias. The work of Sherry Turkle, Kurt Squire, Chad Raphael, and Kiri Miller all make note of the "black box" problem, in which players interact with a system without questioning its hidden assumptions. All social impact games that model real world systems must always simplify their subject material to make it accessible to players, and in doing so, as one G4C member points out, "we are showing our viewpoints, are we not?" Good games for change then, above all else, should avoid the obfuscation of assumptions. Players should be free and capable, if not encouraged, to interrogate, analyze, and critique a game's procedural rhetoric. Games for change should promote systems and games fluency, arming players with the tools to comprehend and engage in a dialogue with games of all sorts, even those games we disagree with. I consider my advocacy for social impact games as similar to my advocacy for political practice based on logic and reason. Just as students learn (or should learn) the components of a well honed argument, so should players learn the components of games-based persuasion and education. Social impact games can and should disagree with each other, but they should all do so with an emphasis on transparency. We don't all want the same change. We're not all on the same side. I think that's exactly right. I think the most we can do is hope to have a civil discussion, to use the debate/argument analogy again. At the very least we can admonish exploitative and intentionally unethical game design on all sides, and praise the design, if not the message, of games that do advance systems fluency/game literacy. While it's fine to discuss and judge a game's content once it's complete, I think preemptively saying "You should not make this game" is extremely counterproductive. Isn't that the exact mindset that G4C, and most modern gamers, are trying to fix? But I didn't participate in the discussion, so perhaps I'm missing some of the finer points. I'm not sure what you're talking about. Where in the post was anything saying certain games shouldn't be made? Is this post part of a wider discussion I've missed? Jorge seems to be saying that games for change would be most effective and responsible if they were clear and upfront about their assumptions, and encouraged players to think critically about these assumptions - basically, promoting cultural self-awareness and media literacy. That doesn't sound like censorship. Sorry, I was specifically responding to the quote that started the discussion: "G4C members should seriously question whether to help a game that promotes such an industry." It struck me as an odd argument for someone in the group to make. I wasn't taking issue with anything Jorge said - his response was very reasonable. What's wrong with nuclear power? Oh I get it, we should all live in the dark ages with no energy. These environmentalists would cry about a squirll farting in the woods.